Which brand from The AMResorts Collection is right for you? If you’re looking for a premium all-inclusive, luxury holiday resort in the Caribbean or Mexico, then look no further than The AMResorts Collection. Its seven brands all boast their own unique atmosphere and amenities, allowing every type of traveller to find a resort that is right for them. But despite their differences, they all offer the AMResorts promise of Endless Privileges®, Unlimited-Luxury®, or Unlimited-Fun® alongside sun-soaked beaches, elegant accommodations, a world-class spa, gourmet dining, and unlimited premium drinks. Here’s what each of them has to offer. Music is a very important part of Jamaican culture. Music helps punctuate certain time periods in the island’s history, and is an incredibly important part of telling the nation’s story. As such, many of its genres were born out of times of struggle or celebration and some of its music festivals run alongside anniversaries and celebrations. Music is so woven into the fabric of Jamaica that you’ll hear its unmistakable beats around every corner. So it’s well worth swotting up with your handy guide before you visit this gorgeous island. Without a doubt, reggae is the most famous music genre to originate from Jamaica. It has even been credited as the original influence for hip-hop in America. Reggae music at its core, however, is synonymous with both hardship and a good time, both the endurance of and the celebration of overcoming a struggle. Closely linked with the Rastafarian religion, reggae invokes a sense of upliftment and an appreciation of life in all its forms. Folk is the earliest music form in Jamaica and remains one of the most influential aspects of the island’s musical heritage. The music is characterised by three main groups: tunes for work and entertainment, religious melodies, and dance music. Each group has its own harmony, but all share a commonality in the types of accompaniments used, primarily the drum and small wind and string instruments. Towards the turn of the 20th century, the music industry created a vibrant Jamaican music form called Mento. Its medley of banjos, hand drums, guitars and rhumba boxes created a fascinating beat with light-hearted and often times comical lyrics. Ska was a genre that emerged when Jamaica became independent during the 1960’s and is the predecessor to rocksteady and reggae. It is characterised by a walking bass line accented with rhythms on the off-beat, and takes influence from Caribbean mento and calypso with American jazz and rhythm and blues. Ska also managed to make its way to the UK in the 1980s thanks to bands such as The Burial and The Hotknives. Dancehall emerged in the late 80s and early 90’s as an outgrowth of reggae, and is one of the most popular sub-genres of reggae with the younger generation. One defining feature of dancehall is the use of Jamaican Patois, instead of Jamaican Standard English. There’s also a big focus on the instrumental composition of the song as well. Examples of Dancehall deejays include King’ Yellowman, Shabba Ranks, Shaggy, Beenie Man, Buju Banton, Lady Saw, Capleton, and Bounty Killa. The Accompong Maroon Festival is a cultural celebration that commemorates over 200 years since the signing of the peace treaty between the Maroons and the British. The festival marks the victory of the First Maroon War against the British in which they fought for their freedom, led by their late hero Cudjoe. The festival takes place in Accompong each year at some point in January. Emancipation Jubilee honours the contribution of Jamaica’s ancestors through song, dance, drumming, drama, food and fashion. The highlight of the day is the signature cultural concert beginning at 8pm with the midnight reading of the 1838 Emancipation Proclamation, which granted freedom to slaves on the island. There’s also a farmers’ market, craft village, and food court offering traditional Jamaican cuisine. The annual event, under the theme ‘Emancipation Jubilee: The Genesis’, will be held from July 31st into Emancipation Day on August 1st. Jazz n Cabaret is a bi-monthly concert series that features performances from acclaimed Jazz performers. It has been running for 17 years and the line-up includes some of the most skilled jazz musicians from the USA, Canada, the Caribbean and South Africa. Aside from the incredible music, there is also food and drink available as well. The Jazz n Cabaret Recurs monthly on the 1st of every month at the Jamaica Pegasus Hotel. Every year Organic HEART Group of Companies stages what has become a staple on the live music events calendar. At home at the Richmond Estate in Priory, St. Ann, Rebel Salute delivers the greatest roots reggae show on earth. Even more, Rebel Salute serves a strict vegetarian menu complimented by a diet of cultural roots rap from Reggae’s finest. In tandem with this, is the concept of a drug-free, violence-free and non-alcohol event. Combined with the warm hospitality and abundant culture of the Jamaican people, this event is not one to be missed. Next year’s Rebel Salute will happen in the 18th of January at Priory, St. Ann. The year 2019 marks the 27th anniversary of Jamaica’s biggest summer reggae festival, Reggae Sumfest. To mark this occasion, the organisers have expanded the event to a 6 night line-up of activities that will include an All White Blitz party, A Sound system Explosion, Beach Party and along with the 3 main concerts. The 2018 event featured Damian ‘Jr. Gong’ Marley, Beres Hammond, Maxi Priest, Cham, Capleton, Jesse Royal, Raging Fyah, Fanton Mojah, Naomi Cowan, PopCaan, Bounty Killa, Sizzla, Spice, Tommy Lee Sparta, Agent Sasco, Ding Dong, I Octane, D-Major and many others. Next year’s Reggae Sumfest will take place between July 13th and July 20th at the Catherine Hall in Montego Bay. Are you a fan of Jamaican music? Which genre is your favourite? Today we have a very exciting guest blog that comes all the way from Jamaica. Natalia Welsh is Founder & Head Cook of Hungry Eyes Vegan Foods, a vegan catering service in Kingston. She’s here today to introduce you to all the tasty vegan and vegetarian food available in the Caribbean. Take it away Natalia! The connection between palate, people and culture is the bedrock of Jamaican gastronomy. Our food tells stories about Africans, Spaniards and Asians who have migrated their own spices and cooking methods with them to the island since the 1800s. These influences infused Jamaica’s culinary culture with effervescent flavours that tantalize taste buds and mirror the spirit of our people. Building community, sharing stories, and exploring common ground is at the heart of it all. Growing up in Gordon Town, a rural district in the foothills of the Blue Mountains, bush life offered much in the way of homegrown fruit, produce and the freedom to go outside and pick what you need at that moment. Coffee, mint, bananas, tangerines, the juiciest pineapples, and the biggest, creamiest avocados were among the bounty. Real food, grown the way nature intended, is the normal way of life for many people in Jamaica. Living in the countryside, where you literally eat what you grow, ‘organic’ is the only option. If you grew up with your grandmother, you’ll probably never taste something more delicious than dinners she slow-cooked in a dutch pot over her outdoor fire. Ackee is one of the main ingredients in Jamaica’s national dish. It’s a yellow fruit that’s relatively bland and really versatile. Ackee is available almost all year-round. We love it! Ground provisions, which include yam, potato and cassava, are collectively called ‘food’ in the Jamaican vernacular. This is our way of referring to produce that keeps us grounded and full for hours. So, if you go to a cookshop and see ‘food’ as a side order for your ackee and saltfish, you know what we’re talking about. Greens and leafy veggies like callaloo, pak choi and cabbage are in abundant supply and are popular breakfast dishes. Other vegan delights you’ll find at the market and in most local supermarkets are pumpkins, breadfruit and avocado (which Jamaicans call pear). Fruits and fresh herbs are also in abundant supply. Be sure to try coconut water to ‘wash off yuh heart’ (with the jelly! ), jackfruit, guava, guinep and star apple if they’re in season. Jamaica is abundantly blessed with foods that taste good and are good for you. Caption: A traditional (vegan) Jamaican breakfast with sautéed ackee and callaloo, boiled banana, fried breadfruit and ripe plantain served in a calabash bowl. We’re seeing a rise in the number of farmers’ markets focused on providing fresh produce. They’re growing some interesting things too, like oyster mushrooms, swiss chard and a variety of other greens. Farm-to-table dinners are also popping up everywhere. When it comes to eating out, Kingston has a few dine-in vegan restaurants, while most offer take-out only. 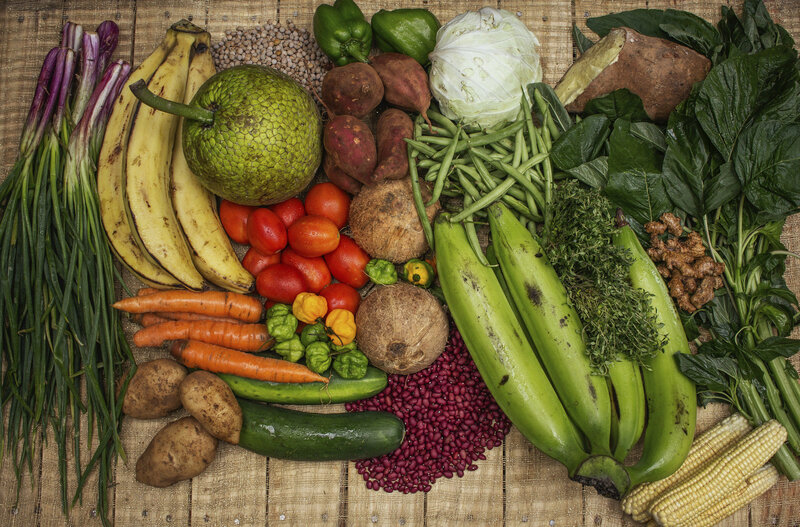 Browse this “Vegan Jamaica Directory” compiled by Marianna, blogger and author of Nana’s Kitchen, for an islandwide listing of plant-based restaurants and caterers. >When it comes to street food, look out for giant soup pots atop roadside coal stoves. Order boiled corn with a piece of dry coconut. Be sure to ask what the corn was boiled in though! Crayfish and chicken feet are regular suspects. When you’re driving the streets of Kingston, listen for a loud, piercing whistle then look out for a man pushing a cart of freshly roasted peanuts. If you’re lucky, you’ll spot a coconut vendor around the corner and just like that, you’re fueled up for another couple of hours. Don’t skip dessert! A slice of sweet potato pudding with ‘hell-a-top, hell-a-bottom and hallelujah in the middle’ is enough for two people – trust me, they’re huge. Look beyond the cruise ships and all-inclusive resorts. If you’re vegan or vegetarian, the shop painted red, green and yellow is the one you’re searching for. One of the things that set Aruba apart from the other Caribbean islands is its buzzing capital of Oranjestad. While Aruba still has everything you would expect from a Caribbean getaway – white-sand beaches, dazzling sunshine – the capital adds Dutch-colonial culture, eclectic nightlife, and incredible shopping. Here are 5 things that you must do while in Aruba’s capital of Oranjestad. Aruba is home to several beautiful beaches, but if you’re staying in Oranjestad we recommend Surfside Beach in the Downtown area. It is home to the warm shallow waters that the Caribbean is famed for, but also boasts many Kwihi trees that create shaded areas to relax. There’s also a floating waterpark for the kids, beach bars for the adults, and beach beds for rent. If you want to step back in time and explore Aruba’s history – you need to visit the oldest structure in Aruba. Built in 1798 by the Dutch army, it was originally a military fortification. The Willem III Tower was added to the west side of the fort in 1868. The fort and tower were restored and re-opened in 1983 as the Historical Museum of Aruba. Oranjestad is home to several fascinating museums, but the National Archaeological Museum is considered one of the best. Housed in the former home of the Ecury family, it displays indigenous artefacts dating from as far back as 2500 BC and provides a glimpse into life on the island prior to European settlement. The museum also contains an exhibition of contemporary island artists who use historical themes in their pieces. This is the island’s premier shopping district and is located right in the midst of downtown Oranjestad. Aside from 60 shops (which includes Louis Vuitton, Gucci, Michael Kors, and Cartier) you’ll also find entertainment options and restaurants. You’ll have to travel slightly outside of Oranjestad for this one, but it is well worth it. It’s a non-profit organisation dedicated to saving the island’s donkeys, which used to be a main source of transportation. You can purchase a feed cup at the sanctuary, or you can bring your own carrots. You’ll find it in the Santa Cruz region, and is open Monday to Sunday from 9:00am – 4:00pm. Have you ever been to Oranjestad? What was your favourite attraction? If you’re thinking of visiting the Caribbean soon and want to choose an island of the livelier variety: we recommend Barbados. Not only does Barbados boast beautiful beaches and perfect blue waters, but the island is also home to myriad festivals and events. 2018 has been a particularly great year with more planned before December hits, plus the 2019 calendar is already filling up. Here are just seven of the best events to attend in Barbados. Barbados is considered the Culinary Capital of the Caribbean, so it only seems fitting to start our list with a food festival. Beach Party at the Hilton Resort Barbados along with a final fine dining dinner at a signature local restaurant. The waters that surround Barbados are absolutely sublime and offer perfect swimming conditions. Every year, in early November, Carlisle Bay comes alive with hundreds of swimmers from all over the world as they take part in the Barbados Open Water Festival. The 2018 event will offer 1.5K, 5K and 10K swims. Swimming conditions and the beauty of the island aside, there is a wonderful camaraderie among the swimmers at this event with its laidback island-life setting and the highly popular pre-event practices and social sessions leading up to the swim races. It’s this mix of fun and competition in a remarkable location that has resulted in excellent reviews and many repeat visitors. If you’re looking for a scenic place to go for a morning jog, Barbados certainly ticks the boxes. The route for the 2018 Run Barbados Marathon Weekend includes Bay Street where the Government Headquarters and the Prime Minister’s office are located, Carlisle Bay, Bridgetown Boardwalk, Kensington Oval, Charles Duncan O’Neal Bridge, Independence Square, and – of course – beautiful views of the Caribbean Sea. Sailing has a long history in Barbados with the first organised race around Barbados held on January 1st 1936. Starting at the Barbados Cruising Club, the route leaves through the historic Carlisle Bay, passes the deep water harbour and then begins a 20-mile tight reach in calm water up the platinum coast of Barbados passing the homes of the rich and famous. Then it curves around the top of the island where sailors will pass the Atlantic Ocean, and will face a good 7 miles of tricky currents, wind shifts and big waves. Eventually, they will slide down the 18-mile long south cost and finish up at the south-west point of Barbados. Both sugar and rum form a significant part of the Barbadian Heritage, and this festival invites you to experience the history of both. From rum distillery tours to sugar and rum cooking classes, chocolate making classes, mixology shows, spa treatments, street and beach parties, cane factory, windmill and rum shop tours, the Barbados Sugar and Rum Season is steeped in history and authenticity. This isn’t a festival or yearly event – but the opening of a historical attraction. Once upon a time, Barbados used to boast a train service that ran from the capital city of Bridgetown to Bellepaine, St. Andrew on the east coast. In January 2019, the St Nicholas Abbey Heritage Railway will be opened, (in a million dollar project) and visitors to the island will once again be able to experience Train rides in Barbados. After all that, you’re going to need some food – but not to worry, the food scene in Barbados offers a delicious mix of culinary experiences. Keep your eye out for the re-DISCOVER logo in restaurant windows (there’s also an app you can download), where you can enjoy a 3-course dinner (including a ½ bottle of wine) for US$50 per person (note that an advanced e-booking must be made). There are also 40 restaurants offering a 40% reduction on lunch menus. An exciting calendar of Culinary Experiences, including World Food Day as well as the Barbados Food and Rum Festival has also been launched. Alongside weekly and monthly events such as Hasting Farmers Market, Oistins Fish Fry at Oistins Bay Gardens, and a Sunday Jazz Lunch at Eastpoint Grill. If you’re thinking of jetting off to Mexico or the Caribbean soon with your family or spouse, and are looking to stay somewhere high-end, then we recommend Dreams Resorts & Spas. They boast 14 beach-front resorts across Mexico, Dominican Republic, Costa Rica and Panama. No matter where you stay however, you will find the same sumptuous surroundings and attentive service. That’s because Dreams have a policy of Unlimited-Luxury® at all their resorts. And when they say all-inclusive, they really mean all-inclusive. Included in the price you paid when booking, is gourmet à la carte dining (without reservations), unlimited spirits (including top-shelf), and unlimited natural fruit juices and soft drinks. There are also waiting staff who will bring you your drinks at the pool and on the beach. In your spacious room or suite, you’ll also enjoy concierge service, daily maid service, and a mini-bar that is re-stocked daily. Upgrade to a Preferred Club Room and you can relish in exclusive Preferred Club status and amenities. Then in the wider resort you’ll enjoy daytime activities, theme parties and live nightly entertainment. You’ll also enjoy free Wi-Fi throughout the resort. Children and teens are also welcome at Dreams Resorts & Spas. There’s the Explorer’s Club for Kids aged 3-12 years old, which is included in your Unlimited-Luxury® experience too. Here your little ones will enjoy activities that are both fun and educational while being supervised by American Red Cross certified staff. Some resorts also have a babysitting service at an additional cost, which sits outside of the official children’s club. And of course there is the spa. Their world-class Dreams Spas by Pevonia® boast more than 30 treatments (both traditional and indigenous), along with whirlpools, saunas, and steam rooms, plus participating resorts include treatments for both children and teens too! Their resorts also come complete with a beauty salon and fitness centre on-site. And if you’re a couple looking for an anniversary, vow renewal, honeymoon or full-blown wedding – they can arrange that too. There’s even a Honeymoon Gift Registry where your family and friends can buy you extra resort credit. What’s your favourite thing about Dreams Resorts and Spa? Your wedding day is one of the most important days of your life, so you’ll want it to be perfect. One of the easiest ways to reduce the stress is to have someone else organise it for you. Thankfully there is an endless amount of hotels with beautiful wedding packages that take care of everything – so you literally have to turn up on the day. Whether you’re looking to get married in the Caribbean or somewhere closer to home; a lively resort or a secluded cliff-side hotel, there’s something out there to suit you and your sweetheart. Here are just 10 hotels that cater to couples looking to marry abroad (and all of them 5-star!). 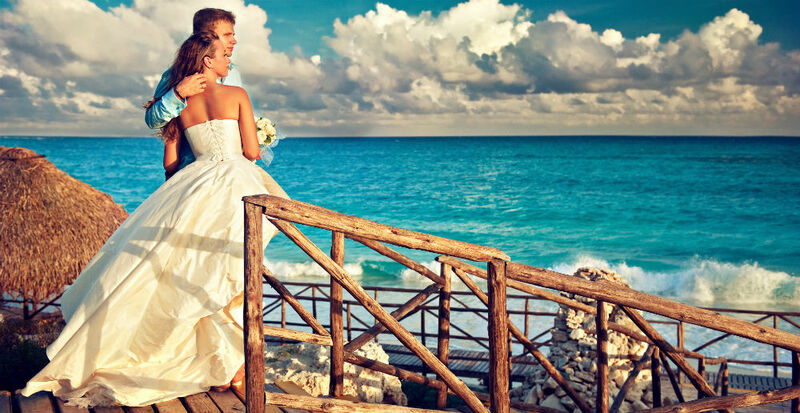 If you’re looking for an upbeat (but luxurious) wedding venue in Mexico, then we recommend Moon Palace. The five-star resort offers facilities for all couples and guests, including world-class restaurants, a lavish spa, and a 27-hole golf course designed by Jack Nicklaus. Their wedding package is also just as exciting. Aside from a beautiful beach-side ceremony, the wedding package also includes a coordinator, bridal bouquet, wedding cake, sparkling wine, gift registry, complimentary honeymoon package – plus that all-important marriage license and certificate! If a laid-back wedding in the Dominican Republic sounds like the correct combination for your wedding, then have a look the Luxury Bahia Principe Esmerelda. This elegant resort has Bavaro’s stunning white-sand beach right on its doorsteps, making it a perfect choice for a romantic wedding. Their Sunshine Wedding Package includes all the basics such as a wedding coordinator, wedding cake and Honeymoon breakfast in bed. However, it also includes extra touches like a semi-private dinner reservation for 30 people, 15% spa discount and 10 digital photos. This resort hotel boasts its own private beach – so no wonder it’s a popular choice with sweethearts tying the knot. There’s also three swimming pools, three whirlpools, buffet restaurant, water sports, volleyball, and evening entertainment. The Sunshine Wedding Package includes all the usual – wedding co-ordinator, decorated ceremony location, bridal bouquet, recorded music for the ceremony, wedding cake, and honeymoon breakfast in bed. On top of that, it also includes 10 digital photos, 15% spa discount, late-check out for the couple, and dinner reservation for 30 people. This luxury resort is a favourite with people looking for upmarket family weddings, romantic honeymoons and other special occasions. There’s an 800-metre beach on its doorstep and, in the resort itself, you’ll find four restaurants, three bars, large swimming pool, 9-hole golf course, boat house with water sports, and a fitness centre. The Wedding Package itself includes a coordinator, decorated ceremony location, candlelit dinner for the couple, a bottle of sparkling wine, wedding gift – plus legal fees, marriage certificate and transport to Port Louis to complete the wedding declarations. This stunning hotel is perfect for couples looking for a lavish wedding. On-site you’ll find three swimming pools (including a lagoon pool), buffet restaurant, outdoor Cypriot restaurant, American-style diner, cocktail bar, and a gym. The Wedding Package here is also just as extensive. You’ll have all the basics like a wedding coordinator, ceremony, bridal bouquet, marriage license, and honeymoon breakfast in bed. But you’ll also be treated to a decorated bridal table, 15% spa discount, and the taxi transfer to Town Hall to sign the documents. There are also a few extras that are subject to availability including late check-out, room upgrade, and cocktail reception. Offering undisturbed views of the landscaped gardens and the coast, this hotel is the perfect backdrop to a romantic wedding. The wedding package itself has all the basics (ceremony, co-ordinator, candlelit dinner, marriage license, and honeymoon breakfast in bed) and a few extras like 25% spa discount, facial for the bride and bathrobes in your room. The wider resort has all the facilities needed for you and your family to relax after the wedding. There’s an outdoor pool, kids’ pool and indoor pool. There’s also a squash court, gym and sauna. For food and drink, there’s a buffet restaurant, poolside snack bar, beach bar, lounge bar and nightclub. There’s also Wi-Fi and on-site reps who visit twice a week. If you’re looking for a family-friendly resort hotel with plenty of activities, then look no further than Stella Place. Here you’ll find a whopping two outdoor swimming pools, one indoor swimming pool, and three kids’ pools (two with waterslides!). On the food side of things, there’s one buffet restaurant and two a la carte restaurants. For children, there are three children’s clubs that covers ages 3-15. There is also a playground, high-chairs and cots. Perched on a hillside, this small but elegant resort provides a breath-taking backdrop for your big day. The hotel itself is modern and comes equipped with everything you need for a relaxing honeymoon. There’s a small collection of sports, three pools, a pool bar serving snacks and a Japanese restaurant serving sushi (as well as the main restaurant). The wedding package here is simple but stylish. You’ll be treated to a ceremony, bridal bouquet, single-tier wedding cake, and sparkling wine on arrival. Register’s fees and marriage certificate are also included. Nestled between beautiful mountains and azure seas, this self-contained resort might be the world’s most beautiful place to get married. Your wedding package itself includes everything you need (co-ordinator, marriage license, bridal bouquet, single-tier wedding cake, honeymoon breakfast in bed and candlelit dinner) but you’ll be treated to VIP check-in on arrival, late check-out until 6 pm, and the option to hire one of the hotel’s speciality restaurants. The hotel itself might have a remote location, but there’s plenty to do on-site to keep you and your guests entertained. There’s archery, volleyball, water polo, tennis, aerobics, aqua aerobics, and darts. There’s also a gym and sauna, as well as 10 swimming pools – one of them a mini on-site waterpark! When it’s time to wind down, there’s a buffet restaurant, tennis café, and four bars, as well as evening entertainment. If you want to combine the beautiful landscape of Malta with a contemporary hotel – then this place ticks the box! Set 50m from a sand-and-shingle beach, this hotel has plenty to keep the loved-up couple and their guests busy. There’s a main swimming pool, kids’ pool and indoor pool, as well as volleyball, mini-golf, French bowls, beach football, and a gym. Food-wise, there’s the main buffet restaurant, Italian restaurant, Jungle-themed American restaurant, Brazilian restaurant, and Asian buffet restaurant. The wedding package here covers all your basics including cake, venue and legal documents. But you can upgrade to the Superior Wedding Package that includes a white dove release, red carpet for the aisle, bridal hair and make-up, and fresh flower centrepiece.